SEPTA’s Broad Street Line in Philadelphia. Philadelphians who are planning to attend either the Festival of Families on the Benjamin Franklin Parkway on Sept. 26 and/or the Mass celebrated by Pope Francis at the same location on Sept. 27 and are relying on the transit lines of SEPTA within the city received some good news on Sept. 8. The Southeastern Pennsylvania Transportation Authority released revised schedules for the two most important lines — the Market Frankford Subway Elevated and the Broad Street Subway — which are bound to relieve stress and save shoe leather for all concerned. They are the only train lines other than suburban Regional Rail lines operated by SEPTA to come anywhere close to the parkway. People traveling in by one of the 1,100 registered buses, which will park at the stadium complex in South Philadelphia, will need to take the Broad Street line from AT&T Station at Broad Street and Pattison Avenue into center city. Tokens for the subway must be purchased now because they will not be sold at the station on the day of the event. The tokens cost $1.80 each, and are sold in packs of two, five or 10 at any SEPTA ticket office in southeastern Pennsylvania. While the SEPTA website offer online token sales, delivery is expected to take five to 10 business days, which may be cutting it too close. See ticket office locations throughout the region at this page on SEPTA.org. 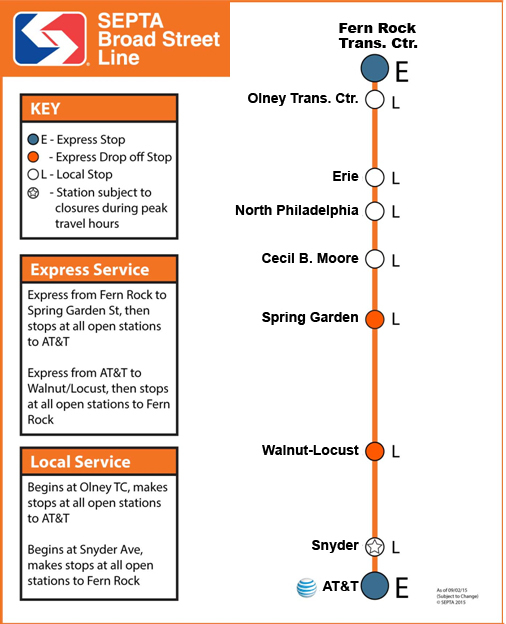 In the original plan released a week earlier, the two lines would operate mostly as express trains out of their distant terminals to the designated stops near center city where they would terminate. They would run into center city in the morning and out of center city in the evening without crossing into the secured zone. Under that plan the Broad Street Subway running south from Fern Rock or Cecil B. Moore stations would express and terminate at Spring Garden. Coming north, it would express from AT&T Station at the sports complex and terminate at the Walnut-Locust Station. Under the new schedule, some trains will still utilize that schedule but others will add stops at Olney, Erie, North Philadelphia and Snyder, which give people who do not live near the terminals more options to come into town. Also, because a train coming south would not terminate at Spring Garden, passengers who wish to attend the visit by Pope Francis to Independence Hall could stay on to Broad and Walnut Streets, cutting their walk in half. 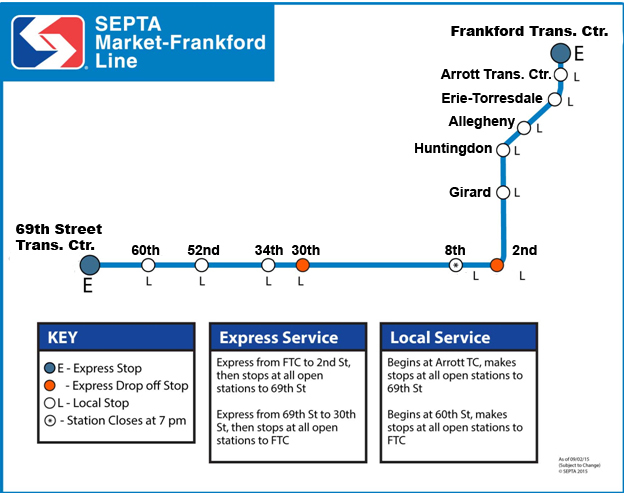 For the Market Frankford Line, the original plan called for trains running east to express from 69th Street and 52nd Street and terminate at 30th Street. Coming south from Frankford Transportation Center (Bridge Street) and Girard Station, trains would terminate at 2nd Street. SEPTA’s Market-Frankford Elevated Subway line. Under the newly released schedule additional stops are at Arrot (Margaret and Orthodox streets), Erie-Torresdale, Allegheny, Huntingdon, 8th, 34th and 60th. In this instance people coming south for the parkway events will not have to detrain at 2nd Street, but can stay on to 8th Street or better yet to 30th Street, which will bring them much closer to the parkway. While there are still a number of stations that will be closed, this new plan is vastly more convenient than that which was first proposed. “Overall, we’ve doubled the number of stations open and we believe we can operate them smoothly,” said Andrew Busch, a SEPTA spokesperson. Unlike the commuter lines for which special passes must be purchased, on the city lines, including Market Frankford and Broad Street lines, current weekly and monthly passes as well as one-day passes and senior citizen passes will be accepted, as will tokens. But all fares must be purchased in advance; there will be no ticket booths or vending machines operating on the weekend. For a complete update on SEPTA’s schedules and operational plans during the papal visit see SEPTA.org. Much better. Now I almost wish I hadn’t made my Disney World plans! !